Looking for the best lightweight portable massage tables? For anyone in the massage business, a massage table is one of, if not, the biggest investment you can make. However, buying a massage table is not as straightforward as dressing up for weekend brunch, donning a party hat and hitting the town. There are several considerations you need to make because the market is inundated with choices. Many of them. Plus, a table you think is perfect for you is not necessarily going to be perfect for your clients, a common pitfall many therapists succumb to. Here are 5 best portable massage tables you should consider. 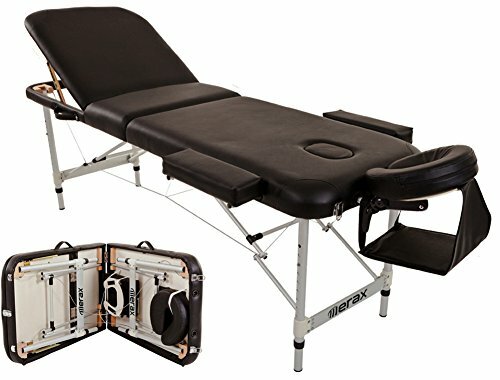 The Harmony DX portable massage table from Earthlite makes a strong case as the best portable massage table out there. At first glance, what will impress you most is the top-of-the-line Hard Maple wood frame which makes for a striking look while promising durability. The legs are stable and the feet are non-slip to keep the table from moving during a massage session. If you feel like this goes against the conservationist in you, you need not worry. The hardwood is sourced from managed forests and environmentally-friendly glues and water-based lacquer are used to treat it. Then there is the plywood decking supporting the table. This is made from a special plywood – aircraft-grade Russian Birch – which makes the table incredibly strong. It is equipped with a full-strength piano hinge which strengthens the frame even more, with a cabling system rated at 1,000 pounds. But the Earthlite Harmony DX has managed to remain surprisingly lightweight (33 lbs.) and can take up to 600 pounds of user weight. A light cushioning system by ‘Nature’s Touch’ covers the table, with silky padding and PU upholstery guaranteeing maximum comfort. The Cloudfill poly-gel used in the construction of the plush face cradle is great quality and super comfortable, and what else you will appreciate about it is that it is adjustable. The cradle can be adjusted horizontally and vertically to accommodate different needs and preferences. We love the fact that the table can be adjusted from 23 to 33 inches as this means more versatility. Disassembling the Earthlite Harmony DX is a cinch and storage should be super easy. 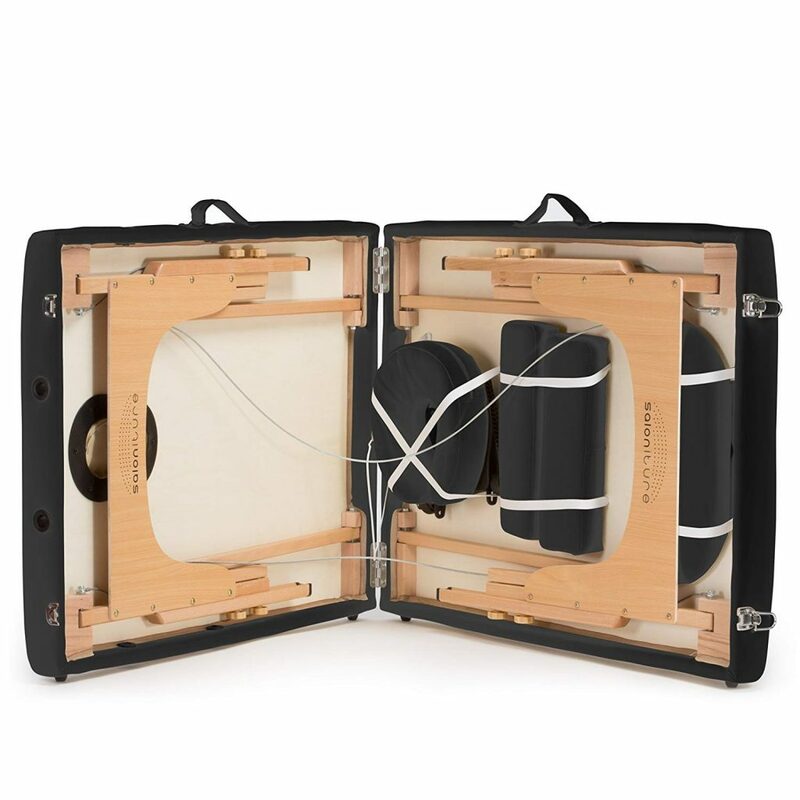 There is a carry bag to stow it away in, and you have the choice of 4 colours for the upholstery.The manufacturer offers a three-year warranty on the foam and upholstery, but you get a limited lifetime warranty on the frame. Overall, the design of the Earthlite DX is very well thought-out and it is just the perfect portable massage table for long-term investment. The Earthlite Avalon offers even more colour options (eight!) and is a strong contender for best portable massage tables. Saloniture Portable Massage Table is one of the best-sellers on Amazon, and while the fact that its attractive price has something to do with it, this is a table that punches well above its weight division. The thing that makes this product different from other budget options is the model has not compromised on quality for the sake of keeping costs down. One thing you will like most about it is the robust hardwood frame. Its stability is reinforced further by steel cables which make it even sturdier than it already is. The Saloniture Folding Massage Table allows for easy height adjustment between 24.5 and 34.5 inches, providing a sufficient range for any use. It comes in a 2-inch high-density foam cushioning for premium comfort, while the face cradle has a 3-inch padding with a removable cover. What else we like about this portable massage table is it has a detachable headrest, arm sling and winged armrests, making it possible to adjust based on individual client needs. On the whole, the deck is very comfortable and each accessory slots in nicely in its respective spot. This portable table weighs 36.8 pounds and can support a user weight of up to 450 lbs. It is very easy to whisk around, and easy to fold and unfold when you need to. A nylon carrying case enhances the table’s portability, and short and slim individuals will find it utterly practical. 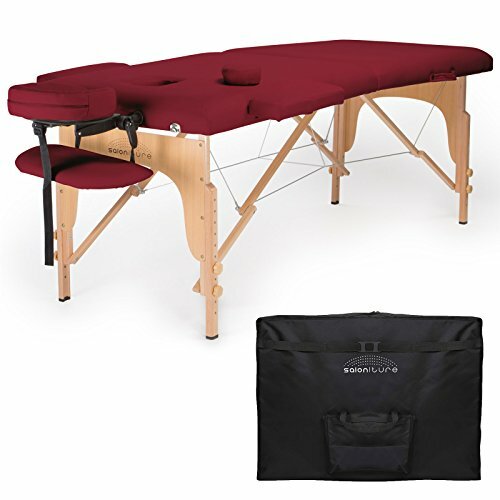 This Saloniture Lightweight Portable Massage Table carries a one-year warranty. 1,500 lbs. aircraft-grade steel support cables give the table a working capacity of 750lbs. The sand/beige PU upholstery is oil- and water-resistant, CFC-free and with denim-like reinforcement backing for extra durability; it's protected by a 2 Year Guarantee. Accessories include: innovative ErgonomicDream face cradle, ErgonomicDream face pillow, Contoured arm rest shelf,and two-pocket carrying case. 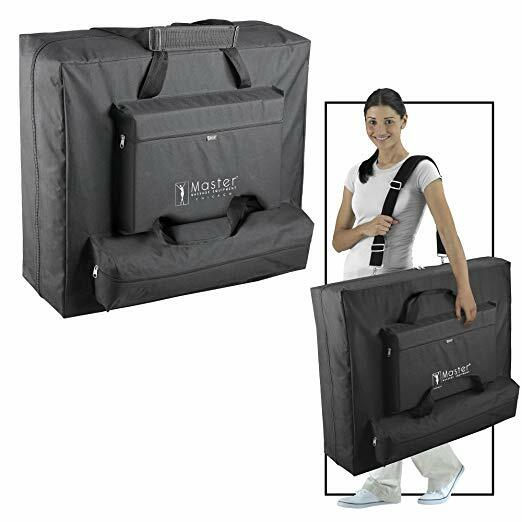 Master Massager makes some of the best portable massage tables around, and as with Earthlite, they could easily stake a claim in the best portable massage tables list with several entries. But if we could pick one, the Del Ray Pro would be it. And here’s why: The Master Massage Del Ray Pro is a very lightweight portable massage table many massage therapists will find a solid business investment. This is a professional-grade table made from managed forest hard European Beech Wood, one of the factors that has driven the cost up. A hi-gloss warm walnut finish with Dura-seal protection rounds out the elegant look. Its aesthetics and overall quality makes it an ideal table for use in high-end establishments. The Quik-Set Knows feature is one of the things you’ll like about this massage table. It allows you to adjust the table’s height with minimum fuss, with a range of between 24 and 34 inches. The Master Massage Del Ray Pro also boasts an incredibly high capacity, making it perfect for heavy users. It can hold a weight of up to 750 pounds, thanks to its aircraft-grade steep support cables. At a super light 34 pounds , it has managed to remain impressively light, even lighter than other options on our list with lesser weight capacity. What’s more, the Del Ray Pro comes with innovative accessories which include an ErgonomicDream face cradle and ErgonomicDream face pillow. The latter is a lush addition which wraps around the face gently, adding cool to what is an already cossetting affair. Other welcome accessories include a contoured armrest shelf and two-pocket carrying case. The Master Massage Del Ray Pro features luxurious sand-coloured PU leather upholstery with warm walnut legs, culminating in a richly elegant look. It is water- and oil resistant, not to mention CFC-free. Beneath the upholstery is a 3-inch thick cushion made from a multi-layered small-cell foam, guaranteeing maximum comfort for your clients. With all these high-end features, it is easy to see why this massage table carries that price. But it is extremely durable and well worth every penny. It comes with a 5-year manufacturer’s warranty. 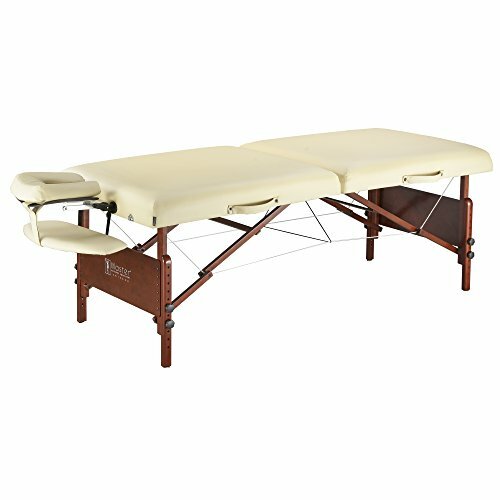 The Coronado Portable Massage Table is another offering from Master Massage worth considering. 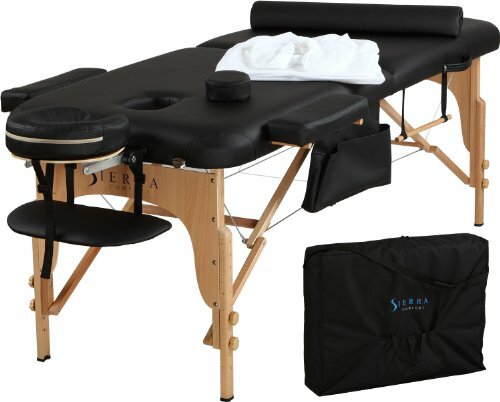 Sierra Comfort has branded this massage table all-inclusive as it comes as a complete bundle with everything you need as a massage therapist to get up and running. This includes pure cotton massaging sheets, oil pocket, a towel hanger and a semi-circle bolster – all to keep your essentials at arm’s length. A carry bag with handles makes it easy to move the table from one location to the next. It folds up neatly, making it super convenient. One, the table is very sturdy and stable; two, it boasts great aesthetics, and three, this is a durable frame that will give you years of service. At 35.3 pounds, this table plays within the confines of lightweight portable massage tables. The same goes for its weight capacity: it can support up to 450 pounds, an adequate maximum threshold for these types of tables. It has an adjustable height of between 23 and 33 inches which means you won’t have to bend unnecessarily as you administer massage therapy. The face cradle is also adjustable. These two things mean the table can be altered to suit different body types. 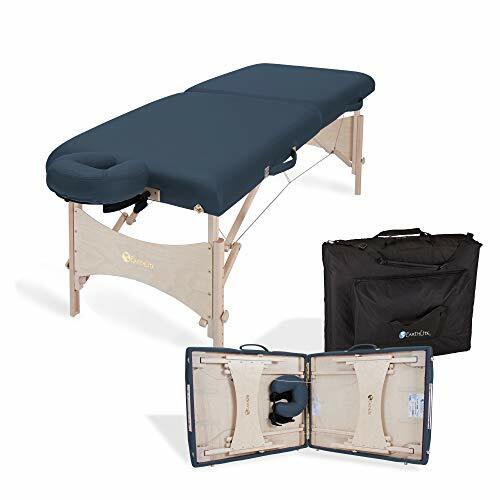 The Sierra Comfort All-inclusive Portable Massage Table comes with a luxurious 2.5-inch high-density foam to keep your customers comfortable during treatment. The deck is waterproof and oil resistant which makes cleaning easier. This product comes with a 5-year manufacturer’s warranty. For masseurs and masseuses who prefer aluminium over wood, the Merax Aluminium 3 is just the table for you. The lightest portable massage tables mostly tend to be constructed from aluminium. But they are still able to hold a good amount of weight – the good ones, that is. This table is a good example. So robust is it that it can accommodate more weight than most wood models of the same size, and we’re not talking about cheap, run-of-the-mill wooden tables. With a weight capacity of 500 pounds, this aluminium portable table even surpasses some top-notch wooden models on this list, namely the Saloniture and Sierra Comfort models. It weighs 37 pounds, which should be portable enough. The face cradle, arm extenders and armrest shelf are both adjustable and removable, while a high quality carrying case promises easy portability. The impressive aluminium frame aside, also worth mentioning is the thick padding on this table. The body of the table is swathed in 2-inch high-density padding which provides good comfort. The upholstery is made from an ultra-soft PU-coated synthetic leather, and is available for purchase in two colour options – a mix of red and black, and an all-black shade. The face rest has been faulted for being a bit challenging to assemble, and a width of 27 inches may be an inch or two thinner. Other than that, the Merax Aluminium 3 is a great portable massage table for anyone in the market for a good metallic model. The Artechworks Lightweight Massage Table is another aluminium portable massage table we would recommend. Regardless of the considerations you need to make, deciding on the ideal portable massage table doesn’t have to be as complicated as mapping out the periodic table. Materials – The best frames for a massage table are either made of wood or aluminium. Wooden frames have better stability, are more durable and look nicer. But they tend to be heavier and could get creaky when you lean in on them or when massaging a heavier client. Aluminium frames are newer entrants into this space, and an influx of low-quality frames have not endeared them to many masseuses. But there are good ones in the market, although these are high end. Aluminium is stronger and lighter than wood, but avoid low-quality tables. Table Weight – A portable massage table should not be too heavy because it is designed for moving around with. Weight varies from one table to the next, but it’s almost always disproportionate to the price. The more expensive the table, the lower its weight. High-end wooden tables and high-quality aluminium models are usually lighter. Anywhere between 25-35 pounds is a reasonable enough weight. Padding – Client comfort is always top priority when massaging, and as such, the foaming is a big factor to think about. Thicker is not always better. After all, you do not want something to make customers feel like they are floating in a NASA zero-gravity chamber. If the foam is too thick, your clients might not be comfortable. And if it is not dense enough, client comfort too could get compromised. While high-density foam might not be as soft as low-density, it is definitely better. Even better is a type of high density known as small-cell foam. Opt for tables that include memory foam technology as they contour nicely to the body. Table Upholstery – Good upholstery improves comfort and enhances the table’s look while increasing the table’s durability. PU leather and PVC vinyl leather are the two main materials used for upholstery. Cheaper PVC vinyl is both oil- and waterproof, and is low maintenance. PU leather, on the other hand, is oil- and water-resistant (not oil and waterproof) but it is the closest thing to natural leather. If you want to keep costs down, don’t dwell too much on the type of upholstery. After all, most of it will spend more time draped in covers and sheets (for hygienic purposes) so you might want to think about directing the funds to good quality sheets and other protective accessories. 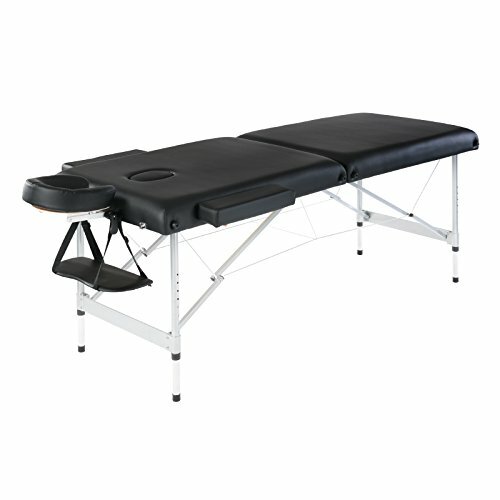 Portability – The whole point of investing in a portable massage table is to have a table that is easy to whisk from one appointment to another. Ideally, you want a table that can fold in a matter of minutes as opposed to spending half an hour folding it up after every appointment. Bulky portable tables also beat the purpose. Make sure the products comes with a portable massage table carry bag. Dimensions – The length and width of the table are other factors to think about when deciding on the right massage table to buy, although the length not so much. That’s because most massage tables come with a standard length of 70 inches which should accommodate most individuals comfortably – unless you work with very tall clients or athletes. As for the width, majority of massage tables fall between 27 and 34 inches. Anywhere between 28 and 30 inches is ideal since the width of the table affects your body mechanics too, and you don’t want a table that will give you difficulty in reaching over. The height is usually adjustable (18-37 inches) and should correspond to the height of the therapist. 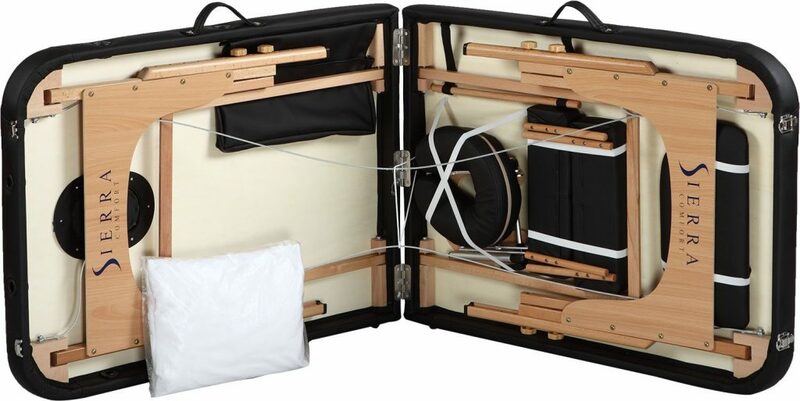 Cable System – A necessary addition to a portable massage table, cables increase the strength and stability of the table and prevent it from rocking sideways or back and forth during a massage session. Good cables should be made of high-quality aluminium or steel, so opt for these over plastic ones. Cheap plastic joints are a no-no. 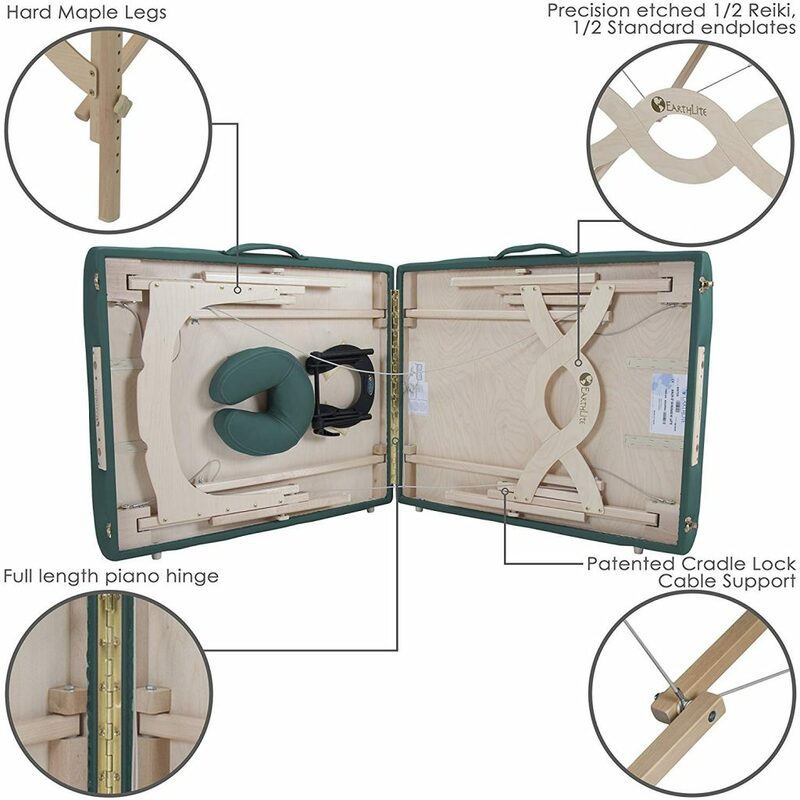 Accessories – These include extras like the face cradle, armrest, towel hanger and bolsters. Cost – Portable massage table costs can vary greatly. You’ll find some fetching at $100 but as with most things, you get what you pay for. Massage sessions are an opportunity to pamper oneself, so unless you’re fresh off college and have exhausted all your finances on tuition, it’s always best to avoid bare-bones tables. You don’t want the sessions to be one-offs, but for clients to give you repeat business. You will find plenty of great portable massage tables available on Amazon and it is very easy to order. As with any other product, though, you won’t find every specific option being offered. But there are more chances of finding it here, and it comes with the benefit of getting a great model delivered to your doorstep without emptying your wallet.